This summer, LAS BICICLETAS celebrates both art and bicycle riding in one of the most important cultural hubs of the world. 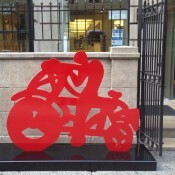 One hundred twenty-two “bicicletas” sculptures will be installed in ten public spaces throughout Brooklyn and lower Manhattan during the months of July, August and September. The public will be encouraged to visit the exhibit on bicycle, following a route of approximately then miles of bicycle lanes and paths. LAS BICICLETAS was first exhibited as part of Aceves Navarro’s 2008 retrospective exhibition in Mexico City, Mexico, when 110 bicycle sculptures were presented in the esplanade in front of the Palacio de Bellas Artes and the adjacent La Alameda Park. Since then, LAS BICICLETAS has been exhibited in Monterrey, Mexico, in both 2010 and 2012, and 11 of them are permanently installed in the municipality of Tlajomulco Jalisco, Mexico. Aceves Navarro said his inspiration for the bicycles came from a growing need for alternative transportation, especially in urban spaces. “Las Bicicletas stems from my desire to connect people and the environment. 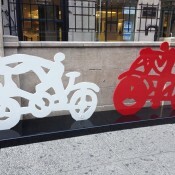 It is my hope that while New Yorkers are enjoying the summer, the exhibit prompts discussion about the overuse of automobiles in modern cities, and the other options that exist for transportation.” Las Bicicletas NY is working in close partnership with the NYC Department of Transportation’s Art Program, and NYC Parks’ Arts in the Park program. For more information on NYC Parks’ Arts in the Park program, visit nyc.gov/parks/art. 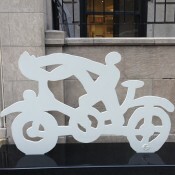 For more information on the NYC Department of Transportation’s Art Program, visit nyc.gov/dotart. 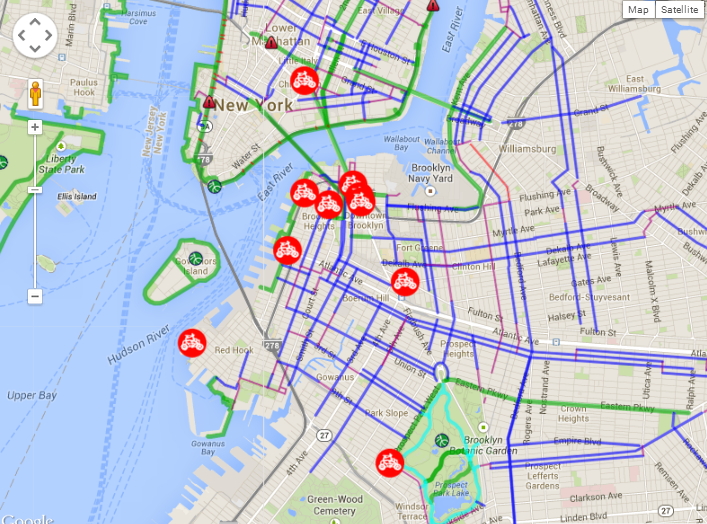 For more information on Las Bicicletas, check it out online . Gilberto Aceves Navarro was born in Mexico City on September 24 1931, and he has been drawing for as long as he can remember. Aceves Navarro studied in the Escuela Nacional de Pintura Escultura y Grabado La Esmeralda in 1950, and worked with David Alfaro Siqueiros on the murals of the UNAM (National Autonomous University of Mexico) in 1952. Aceves Navarro’s work has been exhibited several times at every major museum and gallery in Mexico, and his murals are permanent fixtures in Mexico City. He has also exhibited at the Pan American Union meeting in Washington, DC, the Brooklyn Museum, IBM Gallery, the La Joya Gallery in Los Angeles, as well as São Paulo, Brazil, Havana, Chile, Colombia, Japan, Spain, and Germany. In 2008 the first retrospective of his career featured over 400 of his works at the Palacio de Bellas Artes. Since the 1970s, Aceves Navarro has influenced generations of artists through his academic work in the ENAP and in his private studio. Now over 80, he still paints every day, confirming that “drawing is fundamental to my life.” Aceves Navarro’s work has also been described as a precursor to figurative expressionism. Gilberto Aceves Navarro is one of the most important Mexican artists alive.